Marie Belloc Lowndes is really not that obscure of a crime-writing woman writer, because she is largely remembered for her book The Lodger (1913), which centers on a husband and wife who find themselves in dire financial straits. They are quite literally pulled back from the edge of starvation and ruin when a gentleman calling himself Mr. Sleuth comes to take a room in their home. 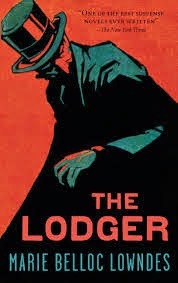 The Lodger was the basis for five (yes, five) films, beginning with Hitchcock in 1927, with the latest adaptation in 2009. In 1960, believe it or not, it was even adapted as an opera. Aside from The Lodger, Mrs. Lowndes also has a huge bibliography of other books to her credit. One of these is Letty Lynton, which is most definitely an obscure, forgotten novel, and which like The Lodger, went on to be made into a movie in 1932. 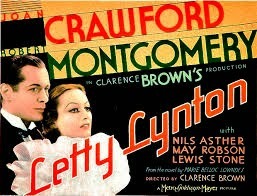 The film starred Joan Crawford and Robert Montgomery; I tried to lay hands on a copy but found none available. Aarggh! Hopefully someday it will turn up on TCM. Both of Lowndes' novels here are based on true crimes. The Lodger is very loosely based on the crimes of of Jack the Ripper, but is actually more of a highly-atmospheric, psychological study of a woman faced with a horrible dilemma, eaten up by fear and guilt. The tension and feeling of dread builds slowly as the novel progresses, and I have to say that this was my second time around with this novel and I was just as sucked in to it this time as I was the first time I read it. Turning to Letty Lynton, Lowndes based this book on the story of Madeleine Smith, a young woman who found herself standing in the dock in Glascow in 1857 accused of murder. Letty Lynton is moved out of the Victorian era, and is the story of an 18 year-old daughter of a millionaire. Among Letty's other traits, she is pampered, at odds with her mother (for whom the sun rises and sets in Letty's older brother) and is so beautiful that men are drawn to her like bees to honey. Sadly, one of these men gets it into his head (after being led on shamefully by young Letty) that the two are engaged to be married, and pressures Letty to tell her family about him. Things take a terrible turn when Letty is introduced into London society and becomes the object of a lord's affection -- the Lynton family is ecstatic but they do not know that Letty's future and the indeed, the reputation of the entire Lynton family is in jeopardy. If the opportunity ever arises to read this book, I guarantee that you'll discover one of the best and most appropriate endings to ever find its way into a crime novel. It was so well done that I was actually taken by surprise, which for me personally is a rarity these days. I'm going to try to figure out exactly which of Mrs. Lowndes' novels are crime novels and try to find them -- finding a keeper copy of Letty Lynton was incredibly difficult and I had to bite the financial bullet to get one. It was worth every penny and more if for nothing else, that ending. Wow. Now I absolutely MUST see the film! 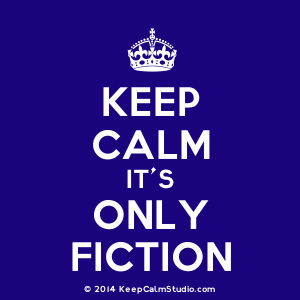 the holy grail of mystery/crime fiction? Perhaps.